Grevillea ‘Lady O’ Is a member of the Proteaceae family and is a hybrid whose parents are a Grevillea victoriae hybrid and Grevillea rhyolitica. Our plants reach a maximum height of 1.5 metres with a spread of about one metre. The glossy leaves are about three centimetres long and carried on slightly pendulous branches. Red flowers are carried in terminal clusters that are about five centimetres long. Our plants carry blooms for many months. In more temperate areas you could expect plants to be constantly in bloom. The flowers are rich in nectar and are a magnet for honeyeaters. 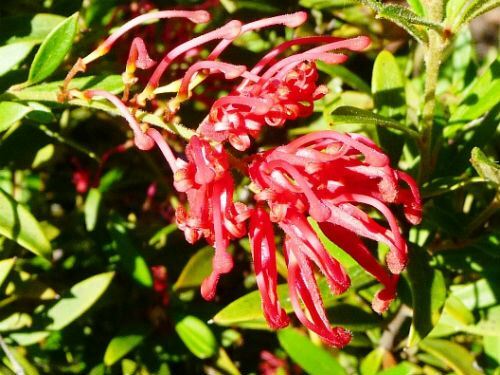 Grevillea ‘Lady O’ is a very hardy hybrid and has proved to be frost tolerant and once established has low water requirements. This hybrid would be an ideal addition, as a foreground shrub, in native garden beds. Grevillea ‘Lady O’ is a product of the Bywong Nursery, in southern New South Wales. This nursery is producing a wide range of interesting native plant cultivars and hybrids.